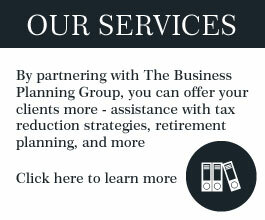 The Business Planning Group is one more way that Drake Software focuses on ensuring success for you and your clients. It was formed as a back office for your firm to provide case management, review, preparation, and technical support for tax preparers who use Drake Software in the areas of tax reduction through qualified plans, retirement estate planning, and business continuation and restructuring. BPG has specialists in these areas exclusively available to you through your relationship with Drake Software. Transparency, service and integrity are the building blocks for the Business Planning Group, as are the principals and staff, who have 40-plus years of experience and more than 150 years of combined practical experience. The owners of the Group—Frank DeArmond and Tony Brooks—are committed to your success. 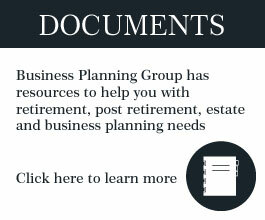 As a Drake Software user, you are offered free membership in The Business Planning Group. We encourage you to take advantage of the services and support we can offer. Visit the “Join BPG” page to register as a member. Once you have registered, you will have access to our team of specialists. You will also receive our newsletter with updates on the services we offer. As a tax professional, you are among your clients’ most trusted advisors. Assist your clients by providing the right financial professionals with whom to work, and build your business in the process. Use our easy, 4-step process to create a financial plan for your clients. Click here to view our newsletter. It is a great resource for your business!